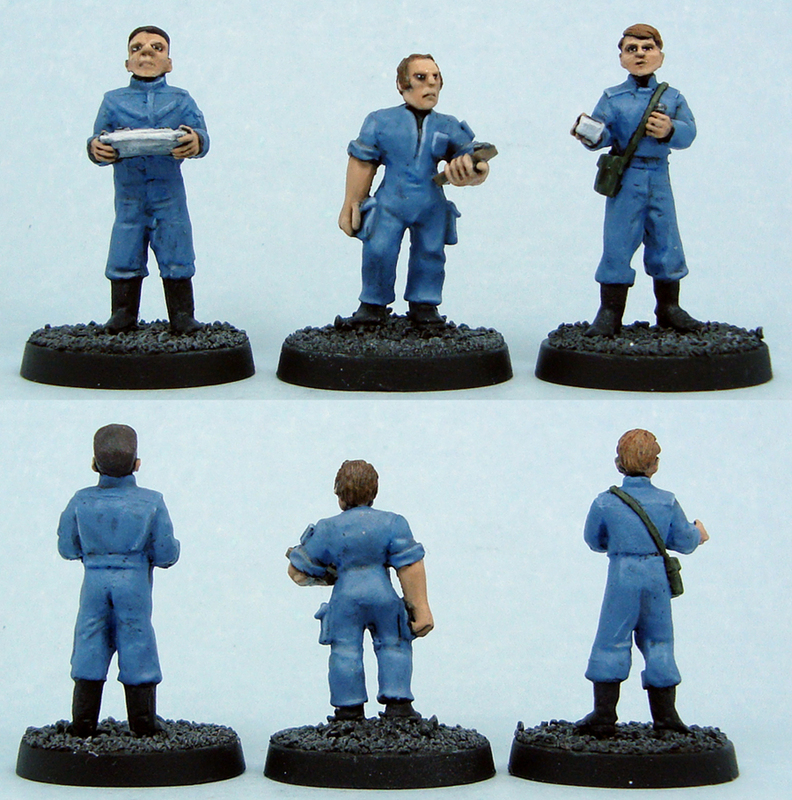 The models on the left and right are from Victory Force miniatures, from their not-Star Trek range of space explorers. While (or because) they have have very short arms and big heads, they’re very characterful sculpts and were fun to paint. The one in the middle is a not-Bishop from Woodbine’s scifi range. As with other Woodbine models, the style is quite cartoony, making the model easy to paint. These were quick paintjobs, and I’m happy with the end result. Androids feature heavily in the Alien franchise, so I thought it only appropriate to include them in my games as well. This trio featured in the second game of the Utopia campaign, where they were the assistants to a Weyland-Yutani scientist. The simple paint scheme is based on the blue-grey overalls worn by Bishop in Aliens. They also tie these synths in with me previously painted combat synth. Comments and critique welcome as always! They look the part. The colour scheme ties the lot together well too. Because I am a geek, I am going to ask you why you decided to give the figures black boots, rather than something reminiscent of the Reebok sneakers that Ripley and Bishop wear in the movie. If they are wearing the same overalls, then the same shoes would be just as appropriate.